Recently I attended a talk titled: How to Create and Manage Remote Project Teams by Wayne Turmel and I thought I would write up my top 5 things to keep in mind when you come into this situation. In order for your team to use these web based technologies they need the right equipment to do their jobs (high speed access, laptop, cell phone …). Without the right tools they will not be able to complete their job. Pick the right technology for managing web meetings, documents, communication, timelines and if necessary timesheet tracking. Not only is it important to have the right technology you need to train your team members and make sure they are using it correctly. Granted, many times you don’t get to pick your team, but if you do, focus on people that are self motivated, have good communication skills and are result driven. By picking people that are open go-getters it will help increase the chance of having a smooth project. With team members all over the place you need to define your team’s purpose and set the ground rules. You can do this with a Team Charter. The Team Charter is a document that defines the purpose of the team, how it will work, and what the communication expectations will be (maybe each team member needs to update the project site daily on what they are working on). Have you ever been on a team and feel that they forgot about you? Multiply that by 10 when you have offsite team members. To help combat this, you the PM, need to set up regular reviews of your team members and if possible try to call them up once a week to chat. If your budget allows it, setup a rewards system, but make sure it is fair for all team members. Many times these rewards are setup for project goals and it will help keep the project on track. If you have the budget the best way to do this is to have a several day face-2 face meeting that includes some offsite fun. If there is no budget, then it could be something as simple as having a page within your project site with photographs of the team members (maybe you mix it up and ask them to include a photo from grade school), a bio, and links to things like their pages on Linkedin, Facebook, Twitter or even YouTube. A new year is here and one of the top trends for 2011 will continue to be where Agile project management is going. Project management organizations embracing Agile software and product development approaches will continue to grow while being faced with the challenge of demonstrating ROI through Agile adoption. In addition, they will need to disabuse their stakeholders and executives of the expectations set by IT consultants, the media and the vendor community that Agile is the next “silver bullet.” Organizations that do it right – including selecting the right projects for Agile – will reap significant rewards. The key is selecting the right projects for Agile project management … but how? Recently, I attended the Madison PMO Manager forum where we discussed this topic. One member mentioned that his organization completes a risk assessment on the project to determine if it is the right fit for Agile project management. 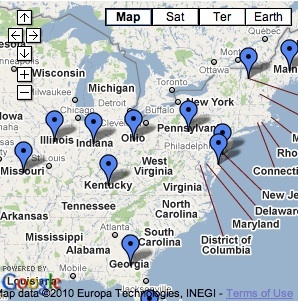 Others indicated that it works well for small projects (making a web app) with small teams that are co-located. You selected a project but how to you measure it? This is where it gets interesting. A PMO has many metrics it tracks its projects for, but with Agile project management you typically only have a burndown chart that is really nothing more than a chart showing 100% down to 0% complete. One way to make measurements is to use the Agility Measurement Index which scores developments against five dimensions of a software project (duration, risk, novelty, effort, and interaction). A second way to is track the goals that are set for the project. Without objective measurements you are just guessing! Why does Agile project management work? 1. The stand-up meetings holds your team accountable. 2. Rapid development of semi-functional software allows you to keep the project going in the right direction and there is less of a chance of it going down the wrong path. 3. Having experienced developers that have coded similar items and expert users as your primary stakeholders will help to keep the project focused. 4. Do the right things! 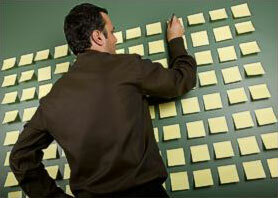 If the post-it notes methodology works and is appropriate for your project stick with it. If you are developing software that is regulated and you need some or a lot of documentation, make sure you create the necessary documentation. You cannot have a one-size-fits-all Agile process. Green, Yellow, Red, Blue project status?